Most of my sphag has spontaneously grown (from spores) in peat etc that ive used for potting. I have used dried new zealand spagh also in the past. Take a picture of some of its stem and branch leaves under a microscope (to see the whole leaf and possibly also under a higher magnitude to see the cells), then we can try to determine it precisely. I would personally guess S. fallax or S. flexuosum, however, I cant remember whether they can have reddish stem and I do not know, whether they grow on New Zealand. hours of fun for you here! Oh that's an easy one to answer. In my time I have participated in surveying a large Sphagnum raft. In a 10cm square several species of Sphagnum would be present. Identification would be done with 10X and 20X loupe on site and some samples requiring to be retained for identification under microscope. Identify one from a photograph? So basically most of them are indistinguishable to normal folks. Could it be from new zealand? Yes as theres plenty of rehydrated new zealand spagh in the greehouse, unless the drying process kills the spores. New Zealand Is not a specific species it's mosses harvested and dried in New Zealand. Unless you specifically imported spores and grew them on in isolation you cannot possibly attribute a location. So basically most of them are indistinguishable to normal folks. So New Zealand long fibre is a mixture of the same species that grow here? Well all the live Sphagnum I've come across is long fibre, none of it came from New Zealand. You only have about 120 species to go through to see which it/they is/are. I have some spare loupes. So basically you dont know? Good, i'll send you a sample, if it turns out to a species we dont have here then it would probably be from New Zealand, now thats sorted i'll get back to something more constructive than reading a long winded response that basically means 'I dont know'. Well yes,, I assumed you didn't know when you asked the question. If its New Zealand Sphagnum, Sphagnum cristatum is the most common harvested Sphagnum there. It likes to grow in greenhouses with us, not outside. Cant stand frost. In New Zealand are only 6 to 9 species of Sphagnum depends on what biologists call a species or just another form of the same species. The other harvested species there is Sphagnum subnitens. To be sure all the above mentioned tools are necessary, because it can be one of ours.. I just learn the lower merits. But in some years I hope to become an expert. What I most need is contact to an expert to get really started. Subnitens is also native to the uk. So that could confuse things a bit. Try flower checker app real good to identify mosses and Plants and mushrooms plus they give you information on the species etc. Hi manders, I have the bbs field guide, if you want bring a sample of the sphag to the Scottish branch open day, I'll bring some loops a microscope and the field guide! Then we can see if we can key this species off. Interests:Sarracenia, disas, fruit trees, vegetables, south african bulbs, cacti...horticulture. This is an old topic, but thought I'd chime in. There are some species or varieties of sphagnum that produce smaller "strands" but in general, the stronger the light you give them, the denser the fibers grow. If the moss you're growing produces relatively "small heads" even in full sun, it's not an ideal strain to grow if you plan on using it as a potting medium. This is because these smaller heads tend to have thinner "stems" which are less fibrous than the strains or species that produce large heads. Less fibrous means less dense cellulose, which translates weaker strands that break down quickly. I've grown a single strain both in part sun/afternoon shade and compared it to the same exact strain grown in full sun:there is a drastic difference in quality. In general, when used as a medium, dried, shade grown sphagnum breaks down quicker and doesn't last as long as full-sun grown sphagnum. I'll also add that when sphagnum moss is grown in full sun and is grown very slowly, it's higher quality (ie. 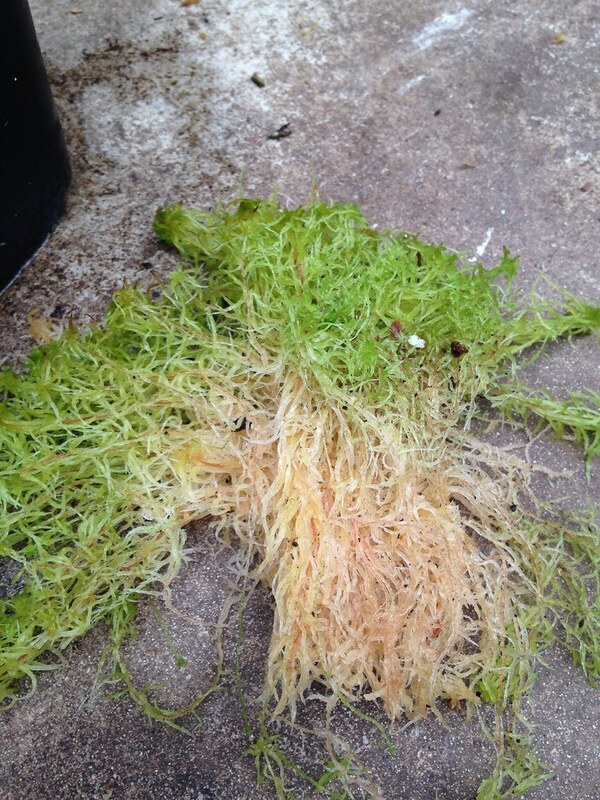 produces denser fibers) than the same moss in the same conditions grown very quickly. There might be "strains" of sphagnum that can be produced quickly and still end up with dense, high quality substrate, but my experience is limited to maybe 3 or 4 different strains total.